What ever happened to “Safe, Legal & Rare”? A few years ago I presented a paper to the Junto titled, “Seeing is Believing”. At that time our country was confronted with the horrors of the abortion industry during the trial of Kermit Gosnell. In the paper I pondered the words of former abortionist Dr. Bernard Nathenson (author of the film Silent Scream) “America won’t reject abortion until it sees abortion”. Thankfully, in the Gosnell case, seeing the truth caused the jury, including nine pro-abortion jurors, to convict him of the murder of an expectant mother and the killing three babies who were born alive. Additionally, the publicity of this trial in the major media (specifically Fox News) led the U.S. House of Representatives to pass the Pain Capable Bill. During the summer of 2015 the nation was again presented with the loathsome practices of the abortion industry when nearly a dozen expose’ videos were released by the Center for Medical Progress (CMP). After viewing the videos a significant number of our citizens became angry enough to call on legislators, urging them to support HR3495, know as the Woman Health and Safety Act. This act would have allowed each State the freedom to exclude abortion providers from getting Medicaid funds. Although the bill passed in the House it was voted down in the Senate. 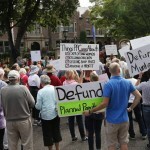 Many who found the actions of Planned Parenthood distasteful also rallied on the State level. The latest victory was in Utah which became the fifth State to defund Planned Parenthood. However, what I found most repulsive was the emergence of #ShoutYourAbortion. This was a misguided attempt by pro-abortionists to bolster some sort of respect for Planned Parenthood in the wake of the CMP videos. The Twitter campaign encouraged women to celebrate their abortion by sharing their stories to help end the shame and stigma of abortion. The following 3 examples show the pervasive self-centeredness of this movement. I’ve had 2 abortions. I don’t have to justify or explain them to anybody. My life is more valuable than a potential life. I’ve never wanted to have children, so I had an abortion. I’m thriving, without guilt, without shame, without apologies. Surprisingly, this strategy marks a departure from their long-standing policy of hiding behind “safe, legal, and rare,” instead trying to convince us that abortion is a trifle, even something to celebrate. This new tactic exposes to the nation what sits at the core of any abortion choice, fear and narcissism. I believe their strategy is doomed to fail because there is an innate stigma attached to the slaughter of innocent human life.